Beef geneticist Fiona Buchanan looks to the insect world to solve one of cereal farmers' biggest problems. As eureka moments go, it didn’t entirely follow the script. There was the flash of inspiration and a flush of excitement when a check of the literature showed that, yes, this could be the real deal. But Fiona Buchanan’s exhilarating news wasn’t immediately embraced. “I told my lab manager Kayla Madder, ‘We’re going to get into mealworms’ and she said, ‘Oh no, we’re not,’” recalled the U of S professor. Raising creepy crawlies was, she admitted, not something you’d expect a beef cattle molecular geneticist to do. But she was able to convince Madder that mealworms aren’t “gross” and raising them actually has an upside. “They’re not maggots, the beetles can’t fly, and on winter days when it’s minus 30 out, she’s in a room that’s 25 degrees and has high humidity. So, she loves these guys,” said Buchanan. Colleagues were also a bit skeptical at first, but then quick to see how raising the larvae of darkling beetles could be a game-changer for Prairie wheat farmers, who have been hit hard by soaring rates of a disease called Fusarium head blight. One possible, but entirely unexpected, answer to that question arrived out of the blue one day when Buchanan and her husband, a grain farmer, were having breakfast with a farmer friend named Dale Hicks. When Hicks mentioned he had heard of an insect that could eat Fusarium-infected wheat with no ill effects, a light bulb went on. As soon as she got back to her office, Buchanan started searching the research literature. Sure enough, there was a paper on a small study that found mealworms could not only survive, but thrive on what would be extremely harmful doses for mammals. It was, to say the least, a surprising find. Fusarium head blight, which is caused by a fungus, produces mycotoxins, including one called vomitoxin that causes nausea, vomiting, and abdominal pain in humans. In livestock, it’s linked with long-term health issues, including decreased feed intake, ultimately impacting growth. Mammals can only tolerate minute amounts—five parts per million (ppm) for cattle and poultry, two ppm for humans, and just one ppm for dairy cows and swine. Those extremely low tolerance levels mean there’s not a lot you can do with Fusarium-infected wheat. Or, at least, until now. The paper Buchanan found hinted at a solution, but it was a small-scale study on just 30 mealworms given feed artificially infected with four types of Fusarium, none of which are the major variety causing wheat farmers on the Prairies so much grief. Moreover, two of those types caused high mortality rates in the mealworms. So Buchanan and masters student Carlos Ochoa Sanabria set up an experiment with a much larger sample (10,000 mealworms) and fed them wheat with a range of mycotoxin contamination from Fusarium graminearum found across the Prairies. The results were everything the team—which included toxicologist Natacha Hogan, insect physiologist Cedric Gillott, and feed processing expert Rex Newkirk, all from the U of S—hoped for. Just how mealworms manage this feat isn’t known. Perhaps there’s some sort of detoxifying bacteria in their gut, or maybe it’s something in the genetic makeup of the insects. “Frankly, I don’t really care—I’m just happy they are munching up wheat that’s currently worth nothing but could now have a value if this pans out,” Buchanan said. Additional studies are planned: Frass (insect poop) will be tested to see if the toxin passes through the mealworms or whether they are somehow able to convert it into something else. Buchanan’s team also has to further investigate whether the critters, when given the choice, will choose healthy plump wheat kernels over shrivelled, infected ones. A study on the effect on chickens is also in the works. 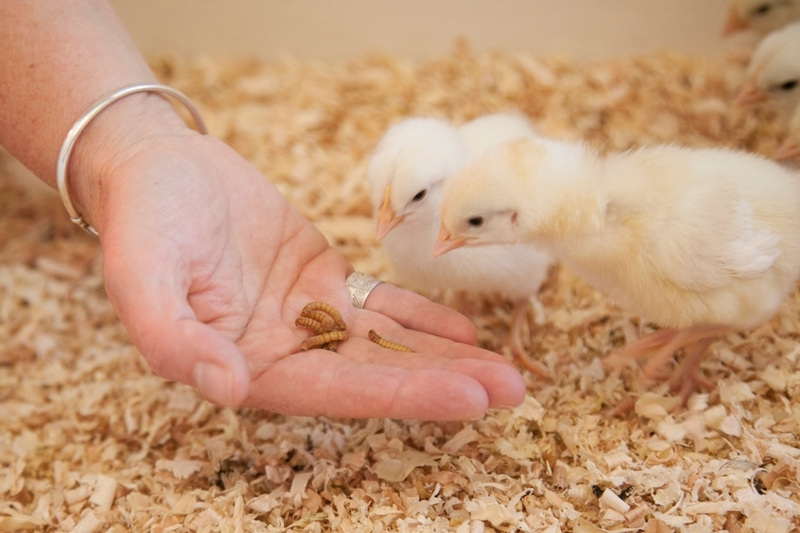 But since the toxin levels in the mealworms drops to 0.13 parts per million (even when the feed has nearly 100 times that level) and the mealworms offer crude protein (with the right amino acid profile) and fat, it shouldn’t be a problem. Neither will production. Buchanan started with 500 mealworms (you can order them online), but now has tubs full of them. 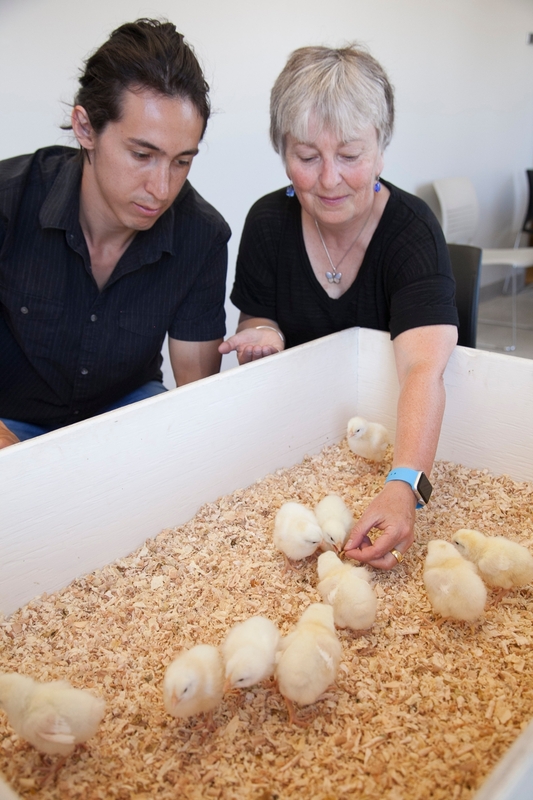 “I personally think the chickens would enjoy eating them live and, let’s face it, chickens and fish should be eating grubs anyhow because it’s part of their natural diet,” said Buchanan, although she acknowledged it’s more likely they’ll be processed into pellets. It all seems like an odd journey, sparked by a comment over coffee to a cattle geneticist. But it’s also a return to a long-held area of interest for the transplanted New Zealander, who came to U of S in 1995. She did her masters on a fungus that infects mosquito larvae, and has a paperweight in her office encasing a giant weta—a mouse-sized insect from her homeland that sports huge mandibles and nasty looking spikes on its back legs. If mealworms live up to their promise, Prairie wheat growers will be saying the same thing.